Zappos.com and BluePrint Juices were once again on hand to bring the style and exciting energy of the backstage of fashion week to the streets of New York, directly across the street from the famed Mercedes-Benz Fashion Week tents. Lovers of fashion who didn't get to experience Mercedes-Benz Fashion Week got the chance to be pampered and feel like one of the models by getting the season’s hottest hairstyle - Braids, trying out a bold lip color, enjoying delicious, complimentary juices, and the opportunity to drape themselves in the season’s must-have clothing and accessories from the Zappos Recharge closet and rocked the outdoor runway. 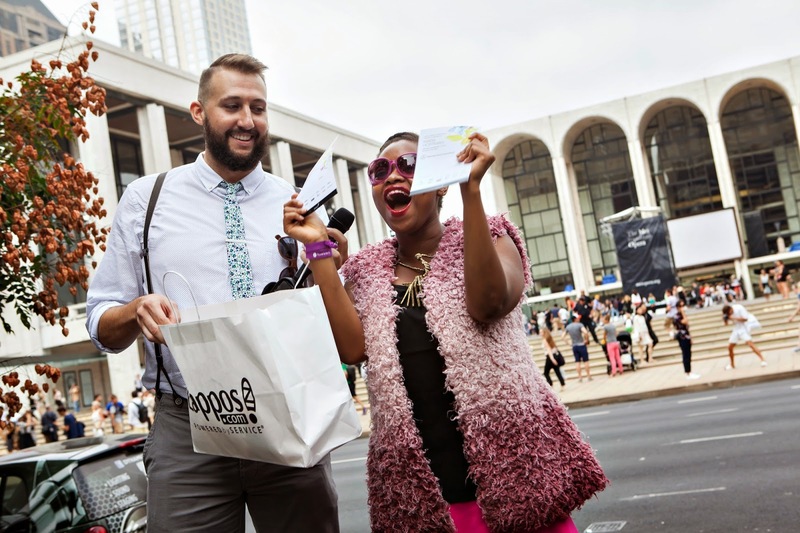 Fashion fans, both young and old, joined in on the fun of the Zappos Recharge Station. Along with the above mentioned glamor, attendees had access to a charging station to plug in and recharge. Model wannabees of all ages rocked big floppy hats, statement necklaces, sunglasses and more before they strutted their stuff and posed for a social photo in front of the iconic Lincoln Center, which was automatically uploaded to their Facebook or Twitter pages, and given printed copies. Our favorite moment from the event (well, we didn't win anything), was the adorable elder couple who walked the runway and posed for their super cute photo, proving you're never too old to strut your stuff.